“In comparing what Texas is more well known for, a bowl of chili or brisket, it’s brisket,” Vaughn says. The official version of chili con carne can only be made by people from Texas. It’s literally the law: In 1977, the 65th Texas Legislature enshrined the stew of beef and chile peppers as the official state dish, but also an official version of the dish, declaring that “the only real ‘bowl of red’ is that prepared by Texans.” Defending chili from non-Texan contamination was at least a half-century too late, but now those offenders slapping ground beef and chili powder on French fries and hot dogs and spaghetti and — despite repeated warnings — adding godforsaken beans would know they were wrong. But the zeal for defending Texas chili has dwindled considerably in the 21st century; there is a new national sensation to claim and protect. In 2013, Texas Monthly barbecue editor Daniel Vaughn, in solidarity with longtime writer for the magazine and proud chili-hater, Paul Burka, launched a campaign to depose chili as the state dish in favor of brisket — specifically, the Texas-style barbecue brisket in the process of taking over the world, its cult rooting down in cities like New York, Los Angeles, and Paris. The debate over the state food is, on one hand, deeply silly. Over the phone, Vaughn explained to me the brisket campaign was his most pugnacious moment as a professional barbecue evangelist. He bears chili no ill will — he just wrote a guide to brisket chili, in fact. His targets were the lobbyists who sought to make chili the state dish in order to promote their cook-off in far West Texas’s tiny Terlingua. “In comparing what Texas is more well known for, a bowl of chili or brisket, it’s brisket,” Vaughn says. But selecting a state dish also, like literally every other question of food ownership in America, quickly surfaces large, painful assumptions about whose food matters and why, fractured along the lines of race, national origin, and ethnicity. Smoked brisket is fetishized as Texan authenticity, but its veneration leaves out many Texans. The cut of beef, as Vaughn later noted in his 2015 profile of Robert Patillo of Patillo’s Bar-B-Q, the oldest black-owned barbecue restaurant in Texas and the fourth oldest in the state, is primarily associated with the state’s white pitmasters, and Texas Monthly’s decision to assess a barbecue restaurants based on their brisket largly left out the black-owned businesses that helped originate and preserve Texas barbecue. The brisket tunnel vision is much less evident in the magazine’s 2017 barbecue rankings. Chili, on the other hand, was originally popularized by women, most of them Tejanas or Mexican — San Antonio’s long-lost chili queens — though they go unmentioned in the state resolution. Whatever the chili lobby’s original aims, it ensured that Texas cuisine was officially represented by a food that spoke to the state’s Mexican roots. And chili con carne, even if it’s now out of style, has had the kind of cultural impact Texas barbecue brisket is only beginning to dream of: Chili was the first and most famous manifestation of the robust, misunderstood, supposedly inauthentic and staggeringly influential cuisine that we now call Tex-Mex. Visitors to Texas often marvel at the endless cornucopia of barbecue establishments and, their guts ruptured, wonder how beef-drunk Texans eat this way every day. The answer is: They don’t. Barbecue is, for most people, a long Friday lunch or weekend drive out to the country, a three-hour wait with a cooler full of beer, a tailgate for meat. Mexican food, especially Tex-Mex, is eaten for breakfast, lunch, and dinner. When I get off the plane in Austin, my first stop is not Franklin Barbecue (though I’ll get my fix eventually). For a taste of what I miss most, I beeline for a migas taco from Veracruz All Natural, followed by a plate of cheese-topped enchiladas at Amaya’s, and then meet friends for a Mexican martini and a huge bowl of queso at Trudy’s. Take it from someone who — while I was the editor of Eater Austin — spent two years chronicling the barbecue boom: It’s time Tex-Mex got its due. The standard narrative about Tex-Mex is that it’s an inauthentic, unartful, cheese-covered fusion, the kind of eating meant to be paired with unhealthy amounts of alcohol or to cure the effects thereof. There’s a lot of easy-melt cheese, the margaritas are made with a mix, and the salsas come from a bottle. In our snackwave food moment, Tex-Mex receives the same amount of affection and respect as a Doritos Locos taco or a microwaved burrito — a processed, comforting, lovable American monster. Those assumptions are entirely wrong. Not only are they incorrect — they were promulgated by elite white food writers in * Pace Picante voice * New York City! In The Tex-Mex Cookbook: A History in Recipes and Photos, peerless Texas food historian Robb Walsh pins the denigration of Tex-Mex on English cookbook writer Diana Kennedy, whose introduction to her 1972 book The Cuisines of Mexico refers to the American enchilada combo plate as “so-called Mexican food” and makes the case that the real cuisine could only be eaten further south — and that there was a “real” Mexican food that exists, period. New York Times food critic and giant of the food world Craig Claiborne was a defender and acolyte of Kennedy’s, and helped popularize her anthropologically dogmatic version of Mexican cuisine. In the late 19th century, San Antonio was a booming railroad town and became famous for its open-air food stalls, run by women, decked out with red-and-white checked tablecloths and laundry lamps, serving food like tamales and chili con carne, according to The Tex-Mex Cookbook. Portrayed as sharp-witted and alluring by accounts from the time (by men), the Chili Queens, and their fame, helped propel their iconic dish out of Texas into the Midwest and beyond. Tamales, which likely already had a foothold in the Mississippi Delta, followed on chili’s heels. Waves of cheesy, spicy, frankly pleasurable Texas-Mexican dishes, with many regional variations, continued to spiral outward in the 20th century and into the 21st: sizzling fajitas, cheese enchiladas, frozen margaritas, queso, breakfast tacos, Frito pie, barbacoa, puffy tacos. Along with the crispy tacos and burritos of Cal-Mex, Tex-Mex became one of America’s most beloved and important regional cuisines, even if most Americans didn’t realize that was what they were eating. The Rio Grande Valley is a three- to four-hour drive south from San Antonio, a rolling, flat, green river delta decked with palm trees, warm and slightly humid, located across its namesake river from the Mexican state of Tamaulipas. Signs trumpeting its tropical climate and welcoming back “winter Texans” (retirees) line every highway — alongside the occasional roadside marker documenting its bloody history. In the 20th century, railroads and irrigation transformed the region into an agricultural powerhouse famous for its grapefruit. The Valley is one of the poorest areas of Texas, and also one of the fastest-growing, heavily dependant on cross-border trade. It’s a bird-watching paradise and home to a robust Mexican restaurant scene, packed with both second or third locations of restaurants from Mexico and longstanding classics serving the Valley’s regional variation of Tex-Mex. A sterling example of classic Rio Grande Valley Tex-Mex can be found at Ms. G’s Tacos N’ More in McAllen. Housed in a white cinderblock building with a green roof, Ms. G’s interior is dominated by a red, white, and green counter, with flyers attached advertising lenten meatless specials and whole-wheat tortillas. The kitchen is visible through a large, wide pass, and drive-thru windows are cut into both sides of the room. The menu board explains the restaurant’s history as the first location of a family-run chain, since sold off, and lists familiar Mexican and Tex-Mex standards like breakfast tacos, enchiladas, and barbacoa. Ms. G herself, whose full name is Yolanda Gonzalez, runs the counter, and she told me that she serves scratch-made food just like her mother and grandmother used to make. Her mother founded the popular local chain El Pato — now a beloved standard across the Valley — in this building. After years out of the industry, Gonzalez took over this location, which had been empty for some time, and opened the restaurant to serve her family’s food. She said that the recipes, which aren’t quite “real Mexican food,” originated from her grandmother, who is from El Carmen, a small town outside of Monterrey in Neuvo León. Maybe it’s not, but it’s ranch food, cooked by the people of this region on both sides of the border. I ordered “soft fried” carne guisada tacos, which means they are dipped in oil but not fried to a hard shell. They arrived nestled in a small paper tray, covered in lettuce, tomato, and yellow cheese. Ms. G gave me extra hot sauce, a mild and tomatoey salsa, and popped back out to make sure I didn’t need extra napkins, since the soft-fried tortillas can get messy. It was a glorious mess — the subtle earthiness of the guisada, that mild crunch of iceberg, and the bite of the hot sauce and salty cheese over top, barely contained by a slightly fatty corn tortilla. The soft-fried tortilla was a new variation to me, but the flavor was pure Texas. But Ms. G’s is also in danger of closing. Her business relies on the drive-thru, and the new restaurant next door is claiming the alley they once shared. She’s trying to work out a solution, or to find another spot. The prospect of losing the original location of her mother’s restaurant clearly hurts — she started telling the same story to a drive-thru customer shortly after I ordered. And that’s the other issue with the classic, locally rooted Tex-Mex served by family-owned restaurants throughout the state— they are in a precarious position of being both perpetually popular and out of style, beloved and sniffed at, poised for reinvention or in danger of being lost as its own living, breathing tradition. While family-run Tex-Mex restaurants might vanish, the key delights and innovations of Tex-Mex are in no danger of disappearance: Fajitas are in every Applebee’s; queso is on the menu at every Chipotle (for now); chili and nachos grace every tailgate; and margaritas end the workweek across America. Tex-Mex is infinite and eternal. But within Texas, the palatial, cheese-drenched, combination plate Tex-Mex restaurant is as out of fashion as the diner in New York City or the steakhouse in Los Angeles or the fancy white-tablecloth continental restaurant in your hometown. Sometimes the food is still stellar; sometimes quality has slipped. The next generation does not always want to take over the family business, and the kids who grew up eating there with parents don’t want to return as adults. In Austin, the rampant gentrification of the city’s Mexican east side, itself a legacy of decades of segregation, is uprooting numerous Tex-Mex restaurants and imperilling others — because the rent skyrockets, because their customers can no longer afford the neighborhood, or simply because the value of the land beneath the restaurant is too high not to sell. In other Texas cities, the situation is less starkly dire, but these restaurants are like the air, the standby pleasure, not usually celebrated as an essential aspect of the city’s identity, by outsiders or insiders. And there aren’t a ton of new Tex-Mex restaurants opening. Texas food media, like all food media, is hungry to celebrate the next new thing. When asked why traditional Tex-Mex might be dying, experts and chefs offer various logical-sounding reasons. Conversations circled back to the same few theories, ones I had entertained as well: Tex-Mex is comfort food, and people don’t want their comfort food to change. At the same time, not everything, not even the combination plate, can endure. People want healthier, lighter restaurant meals, no one wants processed food, and family restaurants can’t last forever. But then, Texas’s other notable tradition, barbecue, is mushrooming across the state. So people want healthier, lighter food like… smoked meat by the pound? No one wants processed food like… barbecue’s ubiquitous accompaniment, white bread? Family restaurants can’t last forever… like thriving third-generation barbecue joints? Many of those smoke-scarred, small-town destinations have recently been taken over by a generation who left for the professional world, and came back once the money, and the TV cameras, arrived, transforming their family’s tradition into a viable business. And many more of Texas’s finest pitmasters are newcomers, blending the austere tradition of perfectly smoked meat with quality ingredients and inventive flourishes, whether it’s a gargantuan brisket Frito pie or Aaron Franklin’s famous espresso barbecue sauce. There are few meals more transcendent than luscious, velvet-soft barbecued brisket, a tough cut melted by hours of fire and smoke to sublime tenderness, served with white bread, onions, pickles, and sauce on the side. The technique and history behind this exalted hunk of beef (Institutional Meat Purchase Specification 120, to be precise, a boneless cut from a cow’s pectoral muscle) encompasses so much of what it means to eat well in Texas — and that narrative has been bought wholesale not just by outsiders, but by Texans themselves. There are also few meals more sublime than a heap of barbacoa served with freshly made flour tortillas and hot salsa. And few dishes move a homesick Texan like a bacon and egg taco, or a bowl of queso and a margarita or three shared with friends. Ask Texas to choose between barbecue and Tex-Mex, and all but the most dedicated partisans will quail. To be honest, I did not realize how important Tex-Mex had become to me while I was in Texas. It wasn’t until after I moved to Los Angeles, the greatest Mexican food city in America, that I found myself cooling on brisket but desperately missing combination plates and breakfast tacos, green sauce and yellow cheese. And my Texas sojourn was pure luck — I follow my girlfriend’s job wherever it leads us. I didn’t grow up eating at Tex-Mex restaurants, let alone my grandmother’s home-cooked Mexican food. This cuisine barely feels like it belongs to me at all — and yet I love it, very much. So why had I, while covering Austin, spent so much more time writing about, and talking about, barbecue? Part of it was the demands of being on a news beat — there were new barbecue restaurants, and dramas, and brisket-battles weekly, and staggering numbers of my readers had a near-endless appetite for reading about, arguing about, and daydreaming about this most hallowed of smoky meats. Meanwhile, few new Tex-Mex restaurants opened, and too many closed. What does barbecue have that Tex-Mex doesn’t? It has meat, it has fire, it has an aura of mastery — and, currently, it’s associated primarily with Anglos, and the area in and around Texas’s famously progressive, and also profoundly segregated city, Austin. The state has a robust tradition of black pitmasters; Franklin Barbecue is located in what was formerly Ben’s Long Branch Bar-B-Q, a black-owned business in a historically black neighborhood, originally created by Austin’s segregationalist 1928 city plan. Black pitmasters at restaurants like Sam’s Bar-B-Que and Hoover’s still smoke nearby. And Mexican pit-smoked barbacoa, a weekend staple in the Rio Grande Valley, existed before Texas was Texas. But the “easy story” of central Texas barbecue, as Daniel Vaughn calls it, disseminated across the country, is about, and told by, people who are almost entirely white, and male. Each of these cooks and obsessives are individually passionate and often brilliant — and some, like Aaron Franklin, are downright leery of their own fame — but the aggregate effect is Texas barbecue being treated with almost comical importance, driven by a self-perpetuating cycle where tastemakers champion genuinely wonderful food made by people who look like them. (This isn’t an issue just in Texas barbecue, but that obsessive model kicked off our smoke-worshipping zeitgeist, and created a model for, say, the Ugly Delicious barbecue episode, which featured no black pitmasters). And that narrative imbalance has real consequences: Collective obsession gave barbecue the means to survive as a scratch-made, wood-smoked art. Until recently considered a blue-collar food, diners in Texas and across the country will wait in hours-long lines to pay more and more, as brisket prices soar and the field grows more competitive. The upscaling of any traditionally affordable food, especially one popularized and mastered by black Americans, is a fraught issue — so is beef’s literally world-threatening status as a cheap commodity. What is true is that the vast majority of the joints at the top of the Texas Monthly list serve high-quality beef. “When you can sell brisket for $20 a pound, then you can create a viable business, and you can create a environment where people want to become entrepreneurs,” Vaughn said. And if there is some grumbling, there are far more paying customers and legions of critics amateur and professional ready to declare this newly expensive barbecue the greatest in the world. And… they’re not wrong. The Janus conundrum that certain foods are both too cheap to sustain a business and too expensive for the communities that nurtured them is an ugly one, but the solution can’t be industrial agriculture, food-stamp wages for cooks, and financial ruin for restaurateurs. When it comes to barbecue, high-quality, ranch-raised brisket, made with care by people decently paid for their literal night-long shifts, has only made the cuisine stronger. Tex-Mex, on the other hand, faces a persistent social pressure to remain cheap. Customers complain when tacos go above $1 and enchilada combos sell for more than $8 — and that pressure isn’t coming from those who can’t afford to pay more. Robb Walsh blames the emphasis on cheapness on Taco Bell, which when it arrived in the 60s, presented a threat to Tex-Mex mom and pops. “They responded by cheapening Tex-Mex and instituting shortcuts like pre-formed taco shells to cut costs, and in the process ended up with compromised Tex-Mex that people tend to vilify,” he says. El Real, the Houston Tex-Mex restaurant where Walsh is a partner, re-creates scratch Tex-Mex cooking with a menu annotated with historic context; they charge $10 for a bowl of loaded queso (Matt’s El Rancho, which originated Bob Armstrong dip, a famous version of loaded queso with taco meat and guacamole, charges $6.95 for a small bowl, $8.95 for a large). San Antonio food and nightlife editor Jessica Elizarraras, who grew up in the Rio Grande Valley in Brownsville, says declaring that Tex-Mex is defined by cheap yellow cheese has a dark side of valorizing poverty and ignoring its injustice. “People ate that way because they had to,” she says. Tex-Mex is treated like every other “ethnic” food in America, as a cheap eat, with little thought to what it costs the people who make the food to keep prices low. Third-generation restaurateur Carmen Valera, a co-owner of Austin’s Tamale House East, says when her family decided to open a new restaurant, she did the math on her late uncle Robert ‘Bobby’ Vasquez’s famously cheap tacos, served at the now-shuttered Tamale House #3, a restaurant which played a key role in popularizing the breakfast taco in the city, especially among University of Texas students and the city’s ‘90s-era slackers. Valera, also a UT alum, where she studied economics, determined that the crispy taco Vasquez sold for $.85 cost $1.17 to make. “A woman who worked with him started crying when she saw this,” Valera says. “She said, He never did this.” Tamale House East charges higher prices for the family’s classic dishes as a result, though it’s still a ridiculously affordable restaurant; Valera takes pride in paying longtime cooks and employees a good wage. In Los Angeles, one of the country’s most boundary-busting Tex-Mex restaurants also charges $10 for a bowl of queso — and $16 for an enchilada combo plate. Nachos are available with a caviar supplement, and the chalupa is made with short rib. Done as fancy for fancy’s sake, a menu like that would have been, at the very least, deeply annoying — but San Antonio native Josef Centeno’s Bar Ama is downright delicious, and deeply steeped in Tex-Mex styles and history. Centeno’s pedigree prompted at least one food writer to insist the chef must be “redeeming” the cuisine. But what if Centeno is just able, by dint both of distance but also of Southern California’s marginally greater willingness to drop $5 on a taco, to give Tex-Mex the love letter it deserves? What Tex-Mex suffers incessantly, in media, in casual conversation, in its relentless commodification to enrich corporations while family-run restaurants struggle to stay afloat, is a lack of love. Or, to get confrontational, a patronizing disrespect. It is stereotyped as cheap without even the backhanded compliment of fetishized authenticity. Texas brooks no insult, especially one originating from New York City. What gives? If the narrative of a cheap, lovable-but-irredeemable cuisine boils down to banal racism, resulting in a systemic undervaluing of Tejano and Mexican-American restaurateurs, cooks, and chefs, the flaw is in the attitudes, not economics or changing tastes. Gustavo Arellano and Robb Walsh both see promise in one variation of Tex-Mex in particular: Tex-Mex barbecue, such as the heaping brisket tacos served at Valentina’s Tex-Mex BBQ in Austin — or the chopped brisket enchiladas at Rio Grande Grill. Arellano notes that Tejanos have smoked Texas-style barbecue for as long as Anglos; a smoked brisket is just as beautifully accompanied by a flour tortilla and an acidic salsa as it is by barbecue sauce and white bread. A very long read, but I thought it would make good conversation. your denver relatives live within a few miles of some of my favorite mexican restaurants here. like I tell my latin friends, I may be a gringo, but my stomach is 100% latino. I tossed the ketchup 4 decades ago for the salsa bottle. One of my favorites is on the corner of Pecos? and.....it's the street that's 2 blocks up from my in-laws. I think it's called Tia's. Hell, I can never remember where they live. 72nd Street? Just as a side note, when I was in the Navy in the late 80's in Christchurch, New Zealand, a Texas ex pat opened the only genuine Tex-Mex restraunt in New Zealand. The Kiwis went nuts over the place. Long lines to get into the place. The forward support base for the U.S. Antarctic program was in Christchurch, and any member of said program automatically went to the head of the line with no waiting. The owner was retired Navy. He Also had the only import licence at the time in New Zealand for Texas Lonestar beer, which the Kiwis loved. As far as I know the place is still in business and one of the highest rated restraints in New Zealand. He still uses authentic Mexican chefs. There are a few Mexican who came up to Ohio to work labor on farms. When they got their green card they opened up a restaurant. Most people don't know what to make of their food because it isn't the usual tex-mex stuff. I love their tortas and moles. I've never made it. Ive always bought it from a food truck or a restaurant. Ive only ever made various taco fillings, and tamales once. I want to make mole poblano. My sainted momma made the BEST posole ever! My daddy wouldn't touch tripe if it was the last thing to eat, and menudo has tripe. 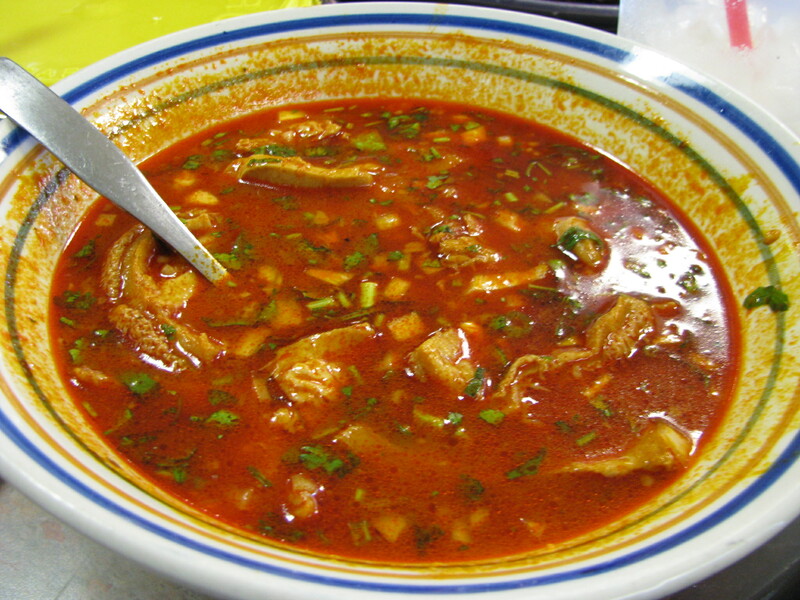 Posole and menudo are the best hangover cures on earth. The best Mexican food is in East Los Angeles. True dat. That's true Mexican food. I moved to Texas and there's nothing but TexMex here. You guys are making up stories again. Everybody on the planet knows it's Jasmins, just a 7 or 8 miles down the road from me. It's more Mex than Tex and and those are real pictures. Never been disappointed by anything on their menu. Well, except for when it's finished. BTW, their portions are usually good for 2 meals. There is a fancier Jasmin in Virginia, but I have no idea if they are related. Do not waste your time with chili powder, it must be made from whole dried peppers. Take the time, make real chili! Another note, don't make your enchilada sauce with chili powder ever, it's an insult to all Mexican cooking. Simmer your peppers, blend and strain. Why not use beef broth instead of chicken if you're using a chuck roast? I like consistency. If you're making a beef dish, use beef broth. I prefer beef stock over broth. That's a good looking recipe. P.S. I am one of those who likes the chicken broth with beef too. Since I can't get decent Mexican food I usually resort to making my own. I make my own chimichangas but I bake them in the oven (they're better deep fried, but I can screw that up). I have a potato dish that I serve with it. One of the things that they over do here in Mexican restaurants is cilantro. Can't stand the stuff. They use very little if any in the places I've been in Denver. What's in the green sauce? Usually once a week I take 2 1/2lbs of tomatoes and one pound of Serranos and fire roast them. Lightly blend cool and add only salt. The Cast Iron I roast them in on the grill provides all the seasoning needed. Then you have a super hot fire roasted salsa. I bring that in to work and then one usually brings in a Habenero and then our new favorite a Chili Pequin salsa. That little pepper is devastating. I grow cilantro because I love it so much. I'm too cheap to pay $2.00 a bunch for what I can grow for $.50. Those look really good Badfish. I'm glad somebody likes it. Somebody brought a salsa to my house one time and got offended because I said it tasted like soap. No more salsa from that guy!!!!!!!!!! Many people think that it tastes like soap. I taste lemony and grassy. I crave it in the winter. I think this may be why I have a unrefined palate. I pretty much hate everything. It seems to be a genetic thing with cilantro. People either have the taste buds for it or they don't. There are many things that I don't like. Olives, eating fresh tomatoes, peas, oysters, and mayo. I used to be a very picky eater as a child, but in college I learned to like a lot of different foods. Shake, pour over Ice into salted low ball glass, swig and repeat! I can't stand the triple secs or flavored liquors.....I keep it simple but the Reposado is a must! If you ever want a good fast chilli, here is the way to go. Buy enough canned chilli (your favorite brand) to feed all the eaters. If its just you one small can will do. King Taco is big here (so cal). Their authentic tacos are the best ever. Preheat oven to 350°F. Sprinkle salt over meat and stir. Place oil in large oven proof pan and place over high heat. When oil is hot, add salted meat in batches to brown. Remove browned meat to a bowl to rest each time until all meat is cooked. Pour off excess oil so only 2 tablespoons remain. Reduce heat to medium, add onions and cook until soft or light brown for richer flavor. Add garlic and cook until soft. Deglaze with 2 cups broth and add dried chilies. Cover and simmer until chilies are soft. Turn off heat and add all other ingredients and 1 more cup of broth, stir. Pour into a processor or blender and puree (loose lid covered with towel, hot liquids release steam rapidly and WILL blow the top off – you’ve been warned.). Place cooked meat back into oven proof pan, pour sauce over, add remaining broth and stir. Place covered pan in oven for 2 hours to braise, checking every half hour to taste and add salt if needed. Remove lid, reduce heat to 250°F for ½ hour. Serve with rice, tacos, or whatever you feel is right.